Beckett Authentication understands that not all items listed for sale have undergone third party authentication. As the buyer you may be uncertain if the item is genuinely authentic, and don’t want to risk hundreds of dollars by purchasing the item without it being reviewed by expert authenticators. 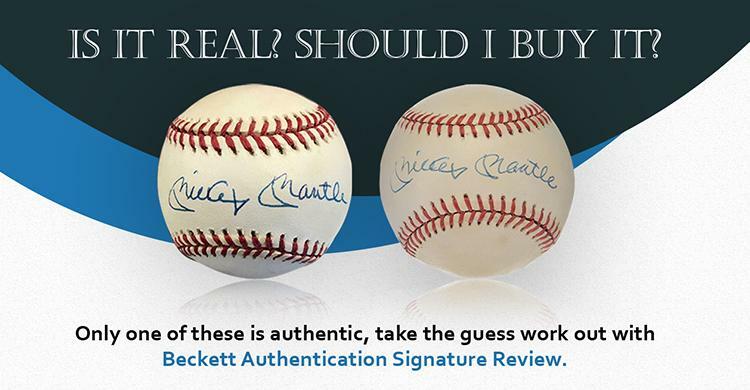 Introducing, Beckett Authentication Signature Review Service. For a nominal fee of $10 the autograph experts at Beckett Authentication will do a quick review of the autograph to give their opinion if the autograph would be likely to pass full authentication or unlikely to pass full authentication, giving buyers peace of mind, even when the item has not been authenticated by BAS. "This brand new service is one that we are really excited to be offering our customers, they have been asking since day one for an online review service, and now it's finally here!," said Jeromy Murray, Vice President for CBCS and Beckett. "We hope that by utilizing this service before making a purchase online or at shows, our customers can save themselves the hassle of trying to get a refund for a non-authentic item from the seller later because they simply knew not to buy it based on submitting it for a signature review." The Beckett Authentication Signature Review service is unique in that customer can upload their own images, it is not exclusive to eBay or other auction houses. 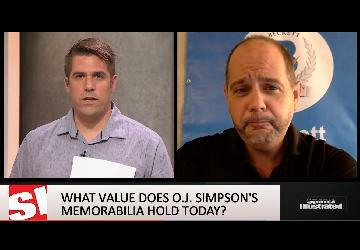 "We realize that people acquire autographs in a variety of ways, whether it be from home shopping networks, hobby shops in their local area, conventions, trading with friends and even the new online marketplaces within social media, so we wanted to make sure our Signature Review service was inclusive to the way that our customers collect," said Murray. "We often received request from customers to check their item before they paid to ship it to us and pay for return shipping back, and now we can offer that, which will be especially helpful for our growing international customer base." Within the next few weeks the Beckett App will update to include Signature Review, making it especially easy to snap photos from a phone and request a review. We will be offering a "lightning speed" option exclusive to the app, where you can see when an authenticator is online processing reviews, which means your request is likely to be processed immediately. When available, lightning speed will allow customers to receive an immediate review of an autograph they are looking to purchase at a trade show, and then bring it straight to the Beckett booth for certification. By speeding up our normal 24-48 hour turnaround on Signature Review requests, we hope that we can create smarter, more qualified buyers in the trade show environment. The Signature Review service provides a quick review of the signature by expert autograph authenticators from Beckett Authentication. It does not undergo the full certification process, but instead provides a candid opinion on the autograph as to whether it would likely pass full authentication or not. In order to receive a full certificate or letter of authenticity the item must be sent in to Beckett Authentication for a full in-person review. © Copyright 2017-2019 beckett-authentication.com. All rights reserved.